The concept behind DIY electronic drum kits is fairly simple — small piezoelectric elements are used to generate a voltage when the drumpads are struck. That’s easy enough, but the mechanical design can be a difficult problem to approach. To solve that, [ryo.kosaka.10] decided to design an E-drum pad made with paper & 3D printed parts. As far as E-drum triggers go, it follows the basic rules — a piezo element used as a trigger with some foam used for damping. For the striking surface, a Tama-brand mesh drum head is used. Being an off-the-shelf drum head, it has a good feel and playability. But the shell is where the creativity really shines through. While the top and bottom parts are 3D printed in the usual way, the main shell of the drum is made with several layers of thick paper laminated together with glue. This creates a surprisingly strong, sturdy shell and is also much faster and less wasteful than waiting for a similar part to 3D print. To round out the guide, instructions are given on how to wire the piezo triggers up for either a regular E-drum sound module or an Arduino. It’s a nice touch, as those inexperienced with E-drums may not be entirely familiar with how they work – this way, anyone can give the project a try. Keen for something bigger? Back in 2014 we saw this awesome 5-piece e-drum kit built out of buckets. Electronic drums are pricey, but the drums themselves are actually very easy to make. By simply putting a few piezos on some rubber mats, you can make a set of electronic drums. The real trick, and the expensive bit, is in the drum module. This module has inputs for the high hat, snare, toms, and bass drum to turn the repetitive thwaking of a stick on a rubber mat into drum sounds. 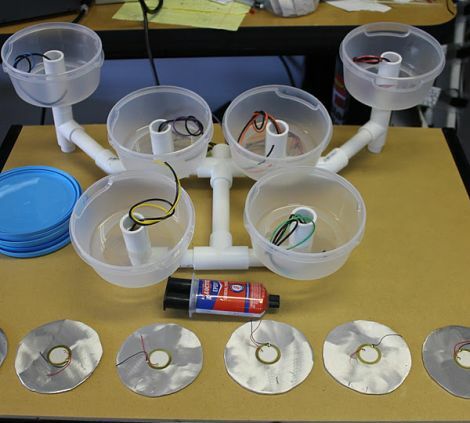 For his Hackaday Prize entry, [Jeremy] isn’t building a set of electronic drums. He’s building a drum module, complete with touchscreen interface and a GUI. This isn’t [Jeremy]’s first go at building a drum module – his first implementation was RaspiDrums, an add-on for the Raspberry Pi that used accelerometers instead of piezos. The software works well enough with a USB sound card to serve as a set of real electronic snare. Now [Jeremey] is moving up to a full kit, and the power of the Raspberry Pi means he can easily add a touch screen to his device. Right now the efforts are going into building a GUI using Gtkmm, and wrapping everything up into a front panel that makes sense and is easy to use. The drums themselves are a solved problem, making this Hackaday Prize entry a fantastic polish on an already great project. Piezoelectric sensors are great for monitoring mechanical impacts with a microcontroller. Whether you’re monitoring knocks on a door or watching a heartbeat, they are a cheap way to get the job done. They do have their downsides, though, so when [Jeremy] wanted to build an electronic drum set, he decided to use more expensive accelerometers to measure the percussive impacts instead. Even though piezo sensors are cheap, they require a lot of work to get them working properly. The ADXL377 3-axis accelerometer that [Jeremy] found requires much less work, plus provides more reliable data due to a 1kHz low-pass filter at the output. In his setup, a Raspberry Pi handles all of the heavy lifting. An ADC on each drum sends data about each impact of the drum, and the Raspberry Pi outputs sound via the native Alsa driver and a USB sound card. This project goes a long way to show how much simpler a project like this is once you find the right hardware for the job. [Jeremy]’s new electronic drums are very well documented as well if you are curious about using accelerometers on your newest project rather than piezo sensors. And, if you’re into drums be sure to see how you can have drums anywhere, or how you can build your own logic drums. The students over at Cornell’s School of Electrical and Computer Engineering have been hard at it again with their senior projects. This time, it’s the very tiny and portable drumset dubbed Drums Anywhere by its creators [Shiva Rajagopal] and [Richard Quan]. Since there are other highly portable instruments like roll-up pianos, they suppose there should be a portable drum kit that actually sounds like drums, and this ECE duo have hit the metaphorical and physical drum on the head… except that this project doesn’t actually use physical drums to make sound. The project consists of two 3D-printed box-like sensors with velcro straps that can be attached to any drumstick-shaped object that might be lying around. Inside the box is a flex sensor and a tiny microphone which report the “beats” to a microcontroller when they strike another object. On the software side, there are two sampled sounds stored in the microcontroller but they plan to add more sounds in the future. The microcontroller outputs sound to a pair of speakers, and the sensors are sensitive to force, so the volume can range from almost inaudible all the way up to [John Bonham]-style booms. This could also be theoretically expanded to include more than two “beat boxes” for extra sounds, or be wireless. The options are virtually limitless, although the team notes that they are limited by the number of interrupts and ADC converters on their particular microcontroller, an ATmega1284. This is another interesting take on a having drumset without the drums, and definitely expands the range of what a virtual drum set can do. It’s also great to see interesting projects coming from senior design classes! Be sure to check out the video after the break. Who hasn’t wanted to rock out on some drums in the middle of the night? If you have anything that resembles neighbors then a midnight jam session is out of the question. That is unless a set of electronic drums is available… but alas, those are expensive. If you don’t have the spare cash burning a hole in your pocket, then be like [Mike] and build a complete 5 piece e-drum set. [Mike] started off with 5 gallon buckets that would become the drum shells. On a real drum set, all of the drums are different sizes in order to produce different notes. Drum size doesn’t matter with an electronic drum as a drum module creates the note and sound. Even so, to make this set a little more realistic, each drum was sectioned and pulled back together to change the diameter. A homemade circle cutting jig and a wood router were used to cut top and bottom rim hoops out of 3/4″ plywood. The inner diameter of these hoops were made just a hair larger than the outer diameter of the 5 gallon bucket shells. The bottom of the top hoop was then routed to produce a groove which would allow a standard mesh drum head to fit inside. [Autuin] picked up the drums at the age of 18, but by his own admission he’s no [Bonzo], [Buddy Rich] or [Ringo]. Practicing always seems to fall off the end of his to-do list, and there really is only one way to Carnegie Hall. One thing [Autuin] is really fast at is typing, so he figured he could improve his drumming skills by banging a few paragraphs out. The core of the build is a Yamaha DTX drum module, a MIDI-to-USB adapter, and little light coding. Basically, [Autuin] made a chorded keyboard out of his drums; by hitting one (or two, or three) drum heads at the same time, he can type characters in Open Office. For going outside the comfort zone of a steady rock beat, we’re thinking [Autuin]’s build might just be useful. He’ll be displaying his Keyboard/Drum mashup at Vancouver’s East Side Culture Crawl alongside a horrible device of artistic merit. If you promise not to break anything, drop in on him in a few weeks. [Ian Cole’s] son is learning to play the drums on an electronic drum set, and he wanted a way to continue practicing during his frequent visits to his grandparents’ house. [Ian] had picked up a Spikenzielabs “Drum Kit Kit All-Inclusive” (DKKAI) earlier this summer, and set out to build an easily transportable drum set. The DKKAI comes with an ATmega168-based board and a set of piezos that can be used to register hits. It was up to [Ian] to provide the rest of the kit, so he set off to IKEA in search of cheap, durable drum heads. He returned with a handful of 1/2 Liter plastic bowls, which he mounted on a PVC pipe drum stand. The piezos were mounted on thin aluminum discs, which were in turn glued to the back side of the bowl lids. The piezos were wired to the DKKAI kit via the PVC tubing, with the signals ultimately fed into an iPad running Garage Band. [Ian] says that his portable drum set works quite well, and although there are some things that require changing, his son is very happy with his new practice set. Check out the video below to see the portable drum kit in action.